Contrary to popular belief, ASC 842 is not the coordinates for a top secret military installation in the Sonoran Desert, nor is it a new highway being built on the outskirts of town. While it doesn't get the attention of its more notable brethren in ASC 606 – the current captain of the FASB football team and all-around swell guy – ASC 842 brings substantial changes to lease accounting standards that will impact nearly every nook and cranny of modern industry. 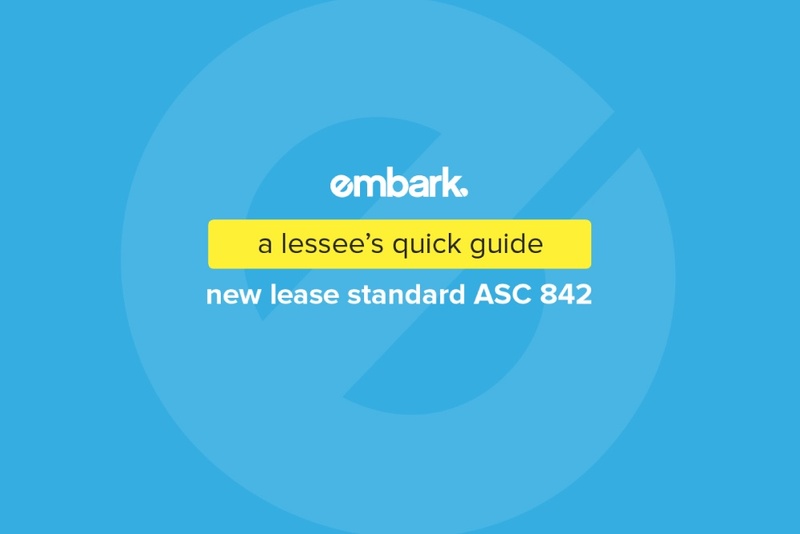 As such, your friends at Embark have done what we always do and provided you a concise but insightful guide for lessees to better understand both the changes included in the new standards as well as a handy implementation timeline, A Lessee’s Quick Guide to the New Lease Standard ASC 842. Adhering to this timeline will help you make sure you stay on track as you hurdle yourself off of the lease high dive to properly determine how the new standards will impact your own procedures. Our guide will help you identify what particular aspects of ASC 842 will affect you, differences between public and nonpublic entities, and any provisions that should be especially considered. As a small teaser, we should say that some of these provisions might even bring a slight smile to your face. Lessees will also benefit from our comparison chart that itemizes the differences between ASC 840 and 842, a simple but wildly insightful inclusion within the guide that should be carefully examined to fully understand the new, far more intense disclosure requirements in 842. Specifically, after investing just a few minutes with our lessee’s guide, you will have a much better grasp on the new intricacies of both qualitative and quantitative disclosures. There will be plenty of time to thank us for our efforts in the near future but, at least for now, dig into A Lessee’s Quick Guide to the New Lease Standard ASC 842 because, as you know, there's no time like the present to roll up your sleeves and get to work. You're welcome.